Taking care of your social media presence is just as important as providing brilliant content for your audience. Not only do you inform them about things they might find useful, but you can also interact with them and receive valuable feedback and ideas for topics, connect with other people in your field and establish collaboration, and reach out to influencers, among other things. However, since there are so many popular social networks you need to be a part of, plus some new ones which show potential, it is almost impossible to manage all of those accounts manually. 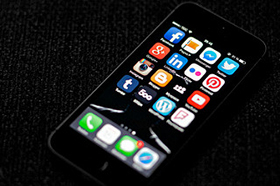 Fortunately, there are plenty of social media scheduling apps you can use to make you job and your life easier. Let’s take a look at 5 most effective. Instagram is definitely hot right now, everybody is posting and checking out images all the time, and having a capable scheduling app that can handle all of your Instagram posts is essential. 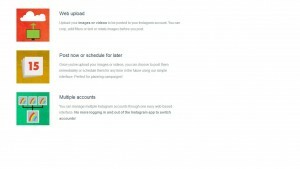 We recommend using ScheduGram, which, in addition to being able to schedule your posts, allows you to manage multiple accounts and grant access to as many users as you want to. You can choose whether to post single or bulk uploads, and there are also some photo editing tools included which can help you enhance you images, add filters, crop, and retouch. For each post, you will receive a notification via email at the time they are posted. If you are looking for a tool that will not only allow you to schedule posts for all your social media accounts, but also to receive detailed reports and keyword searches at the same time within a single stream, you may want to give Sprout Social a shot. Currently, the app provides supports for several major social platforms, including Facebook, Twitter, Google+, Twitter, and LinkedIn. You can also schedule posts and monitor social media activity on the go, since Sprout Social also comes as a mobile app for both Android and iOS. Hootsuite is one of the most established and popular apps when it comes to social media scheduling and marketing. You can use it schedule post, receive in-depth reports, and collaborate with your team members, thanks to built-in team work features. You may notice than it sounds quite similar to what Sprout Social does, but there is one key difference between the two: whereas Sprout Social will display all the data inside a single stream, Hootsuite uses multiple ones. It is simply a matter of finding the former or the latter approach more preferable. 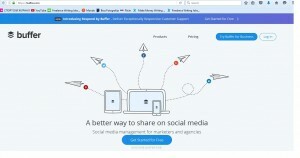 Buffer is also one of the best apps for managing your social media presence and scheduling your posts. The app also comes with analytics tools which enable you to track your audience’s activity and figure out when it is the best time for you to post in the future. We especially love its Chrome extension, which integrates itself seamlessly and never gets in the way, yet it is always there when you need. It is a simpler and more effective way of managing your social media, and you are never more than a few clicks away from setting up anything you want. Those who rely on Twitter to get their message across will find much to like about Followerwonk. This tool comes with a variety on analytics tool which will help you determine everything there is to know about your audience, including their location and the hours during which they are at their most active. This will enable you to target your posts and increase their impact, because they will be read by more people. You can also do the clever thing and integrate it with Buffer, and set it to post schedule posts automatically at the time your readers are on Twitter. While managing your social media presence and getting your content to reach a wider audience is a challenging task, there are some things you can do to make it easier on yourself. That includes relying on apps to help you handle the jobs which don’t require you to use your creative capacities, and that includes scheduling. We hope you will find these apps helpful. Good luck! Kenneth Waldman is a Professional Writer and also a Blog Editor at Essay Writing Service. The areas of his interest include the latest education trends and technologies, digital marketing, social media. You can get in touch with him on Twitter.